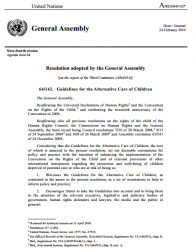 This resolution adopted by the General Assembly provides guidelines for the alternative care of children. The present guidelines are intended to enhance the implementation of the Convention on the Rights of the Child and of relevant provisions of other international instruments regarding the protection and well-being of children who are deprived of parental care or who are at risk of losing family care. Against the background of these international instruments taking account of the developing body of knowledge and experience in this sphere, the Guidelines set out desirable orientations for policy and practice. They are designed for wide dissemination among all sectors directly or indirectly concerned with issues relating to alternative care.